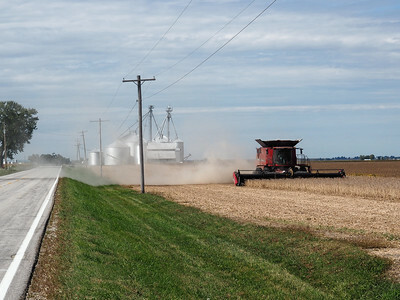 Zig-zagging my way along the section lines to the northwest of LaSalle, Illlinois. 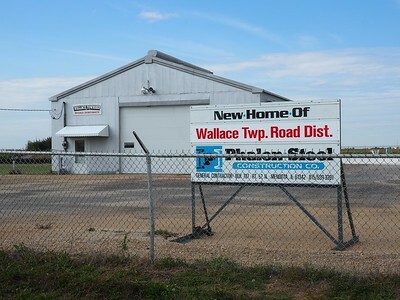 "New Home of Wallace Twp. Road Dist." I have no information on what sort of township building preceded this one, or if there even was one. The name on the sign sounds less like the name of a local government and more like the name of an administrative district of the county government. I don't know if it has really come to that, though. There was enough wind to make the flag stand out, but it wasn't a severe hindrance on this ride. 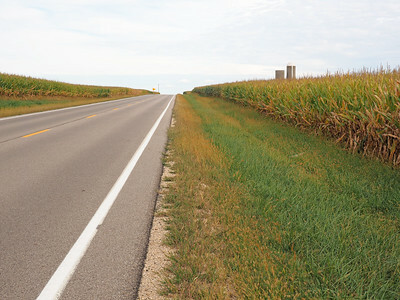 Looking north at the intersection of sections 16,15,21, and 22. 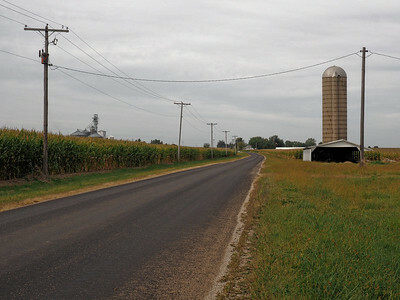 This was the middle of the government survey township that constitutes most of the present-day civil township. 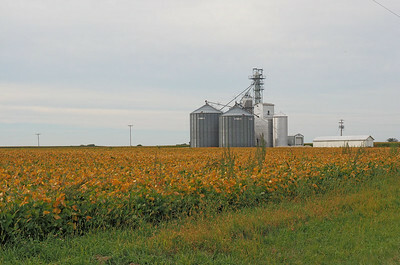 Section 16 was originally reserved for school use and not available for sale by the U.S. government to settlers or speculators. 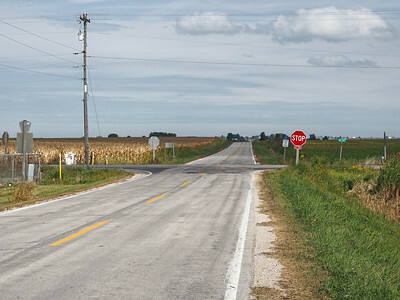 So country schools often ended up being located at this intersection, and after schools were consolidated, the townships that administered the schools often inherited them. In this case, there was a school nearby but not right at the intersection. 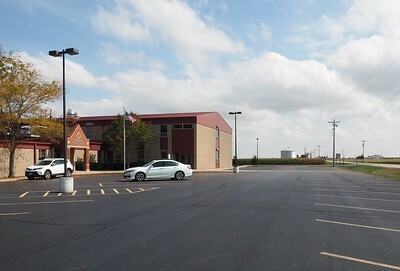 The Wallace Township building can be seen in the distance on the extreme right. There used to be a country school just to the right (south) of it. There is still a country school, but it's a modern facility not too far away from that location. I would guess that it serves more children than just those who live in the township. I was looking for Waltham Township Hall, but it was up ahead, behind the school on the other side of the road. The school sign should have been a clue. 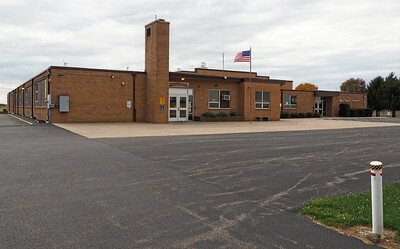 In this case the township hall is adjacent to the school, even if there is no longer any other connection between township government and the school. 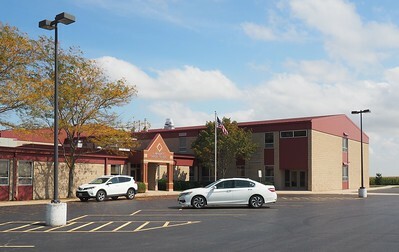 Waltham School. On the school's web site there is information suggesting this country school will be replaced by a new facility closer to North Utica, possibly consolidated with other schools in the district. It is not explained why more consolidation would be better. The Waltham School and Township Hall are adjacent to each other, possibly due from a former close association between the two? However, a 1929 plat map shows the closest school as being not here, but on Section 16 in the very center of the township, across the road and a little further west. Waltham Township Building. 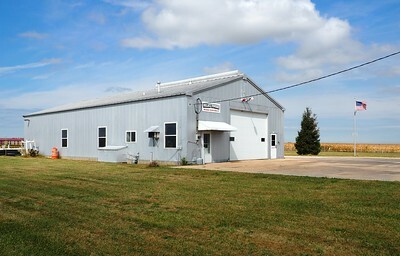 It looks like the garage predominates, as is common in rural Illinois townships. 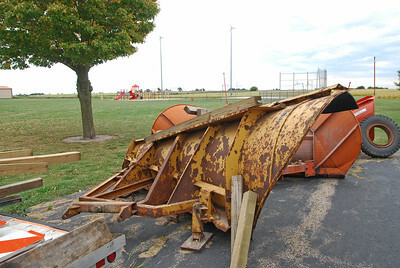 Some of the township roadwork machinery is in the foreground, with the school playground and ball field behind. 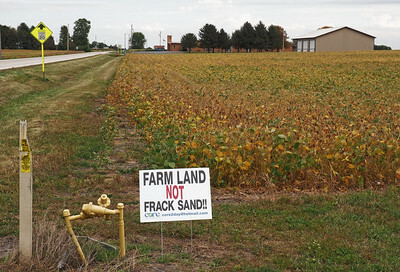 Farm Land Not Frack Sand!! Looking back (east) at the Waltham Township Hall and Waltham School. Sometimes township governments get involved in fracking issues, but this sign appears to be on private property. Still in Waltham Township, but I had just turned west here and was on my way to Troy Grove. 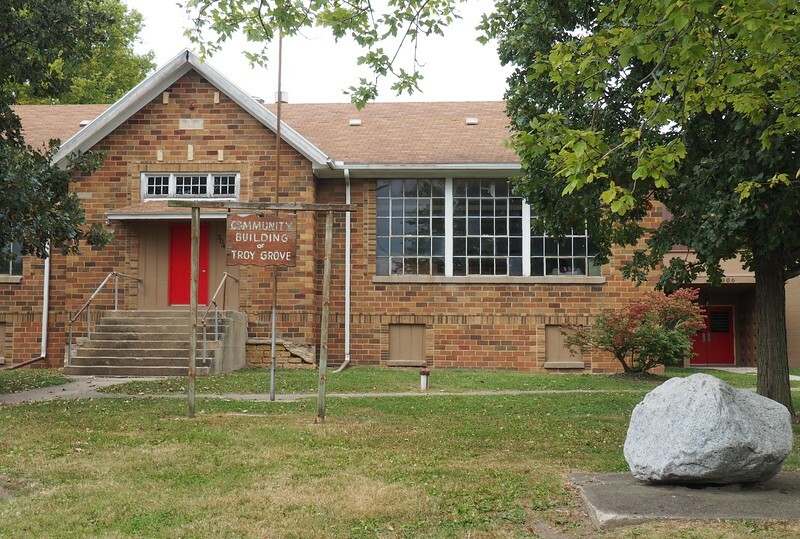 In Troy Grove I hoped to learn that this Community Building, which looks like a former school, was also the Township Hall. But there was no sign that it is. 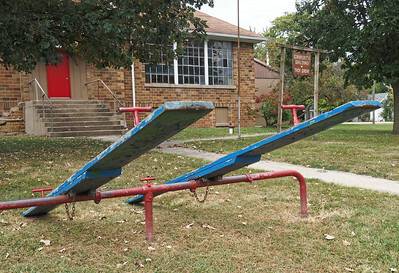 Still no sign that this was also the township hall, even though there are a lot of township halls that have playground equipment left over from their previous lives as school buildings. 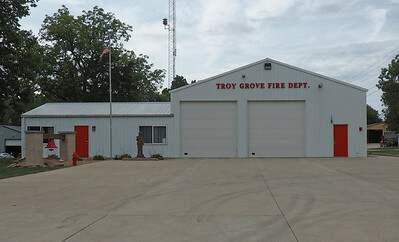 I rode up and down several streets looking for the Troy Grove Township Hall, but with no success. 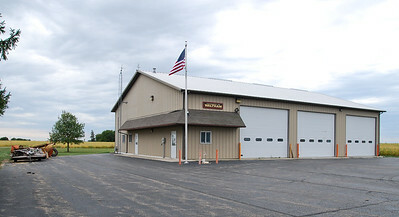 This fire department seemed like a possibility; it's not clear whether it's a village fire department or a township one, but all kinds of cooperative arrangements between township and village are possible for such services. But there was no sign of it being a township building. One thing I never did was check the other side of this building to see if there was a township office entrance there. There were other interesting things in Troy Grove, including this bank across from a town square (with picnic shelter) where I rested and ate a bit of lunch. 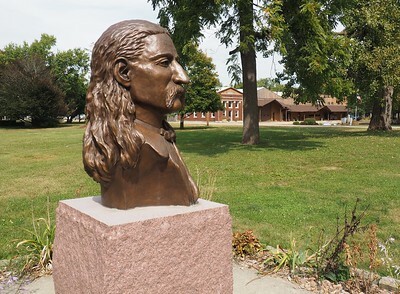 Across the street from the west side of the town square was a memorial to Wild Bill Hickok. This was his original hometown, but the place ws called Homer back at the time. 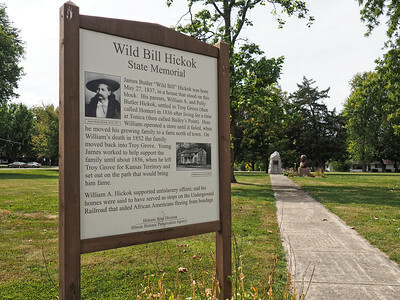 Another part of the Wild Bill Hickok Memorial. 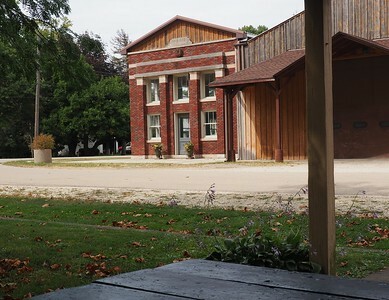 The old bank building can be seen in the background. 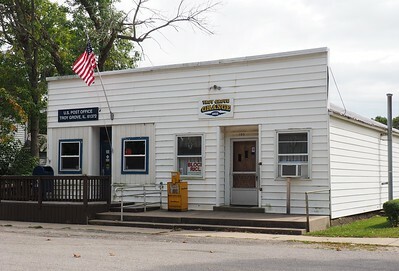 Across the street from the south side of the square are the Troy Grove Post Office and a Grange. 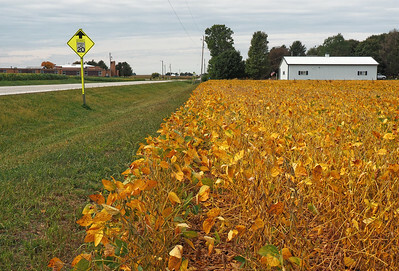 I had come this way in order to see the spot up ahead where the grain bins can be seen above the corn. 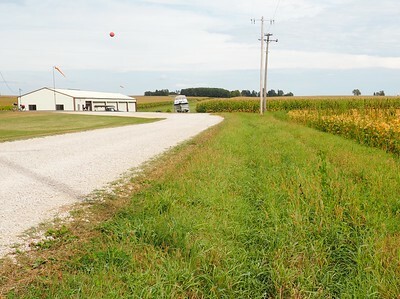 That is also the spot where 3360 East Street becomes County Road 3320E (according to Google Maps). And at one time it was a boundary of sorts between "Indian country" and land available for settlement. 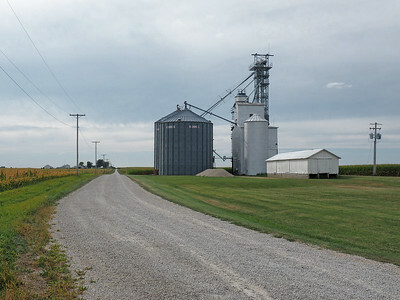 The elevators and grain bins here look like they are arranged for a railroad siding. Whether or not that's why they were originally built that way, the Chicago, Burlington and Quincy railroad did in fact coincide with the old Indian boundary for about six miles from here to the west. 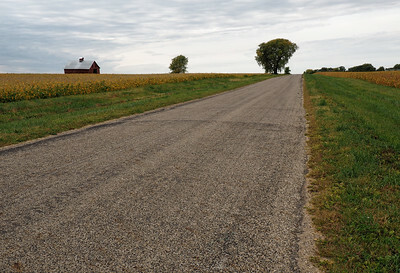 The gravel road doesn't go on for six miles, though. 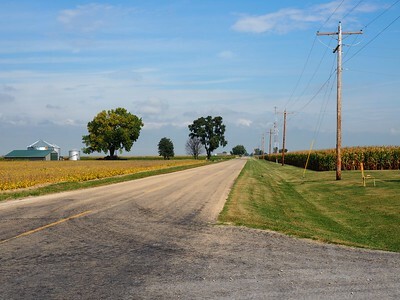 It's a public road but serves as a farm lane that ends at the farmstead on the horizon. 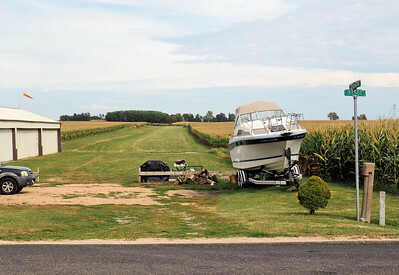 In the grassy space between two cornfields (behind the boat) the railroad and Indian Boundary line continued to the east, but somewhere in the distance the railroad line departed from the treaty line and made a jog of roughly 1/8 mile to the north, where it roughly paralleled it for a few miles, and then diverged further at Mendota. This is a better look at the 1816 treaty line. It and the railroad ran somewhere in that broad path between the corn fields.